In this lesson, we will learn how to use the skill of finding the greatest common divisor to solve situations from our everyday life. Karim wants to give away his collection of 80 green and 62 yellow marbles. If he is going to share them between his friends so that each friend has the same number of marbles of each colour, what is the greatest number of friends he can give his marbles to? Sameh has 4 pieces of wood with lengths 160 cm, 0.8 m, 40 cm, and 2.4 m. He wants to cut all the lengths of wood into equal sized pieces without having any leftover. 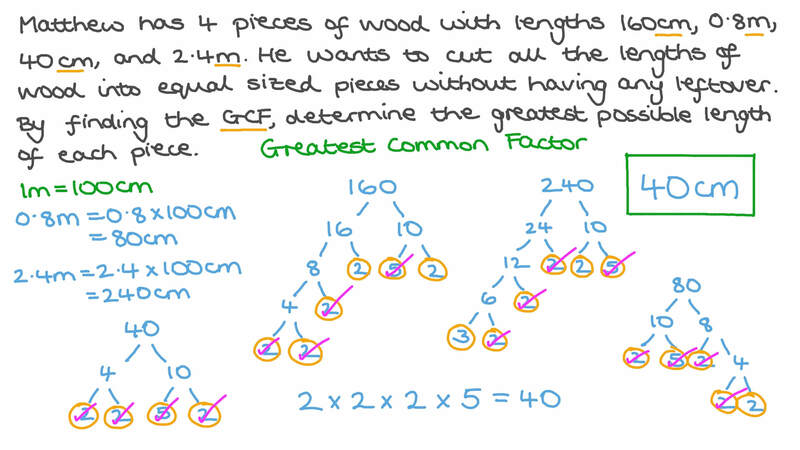 By finding the GCF, determine the greatest possible length of each piece. A chocolate maker wants to use up all of her leftover creations by selling them in boxes. She has 490 milk, 140 white, and 350 dark chocolates. Given that all the boxes need to have exactly the same content, what is the greatest number of boxes she can create? How many of each type of chocolate are in each box? Find the greatest common factor of 14 and 55. A bookcase has three shelves. One shelf holds 4 books, one holds 6, and the other holds 8. Different numbers of identical section dividers are placed on each shelf, so that each section holds the same number of books. Determine the greatest number of books that can be put in one section. Samar wants to make beauty packages as Christmas presents for her close friends. She has 16 lavender oil bottles, 24 bath bombs, and 14 bars of natural soap. If each package contains the same quantity of each item, and she shares out all of the items, determine the greatest number of packages Samar can make, and then determine the number of items in each one. To perform the never ending handkerchief magic trick, a magician wants to cut a yellow silk fabric of length 28 inches, a green one of length 36 inches, and a red one of length 46 inches into handkerchiefs of equal lengths. If he uses the total length of all the fabrics, determine the length of the longest handkerchief he can cut from each fabric, and then find how many handkerchiefs he can make in that case. To encourage public transport, Leo wants to gift some of his friends envelopes with bus tickets and underground tickets in them. 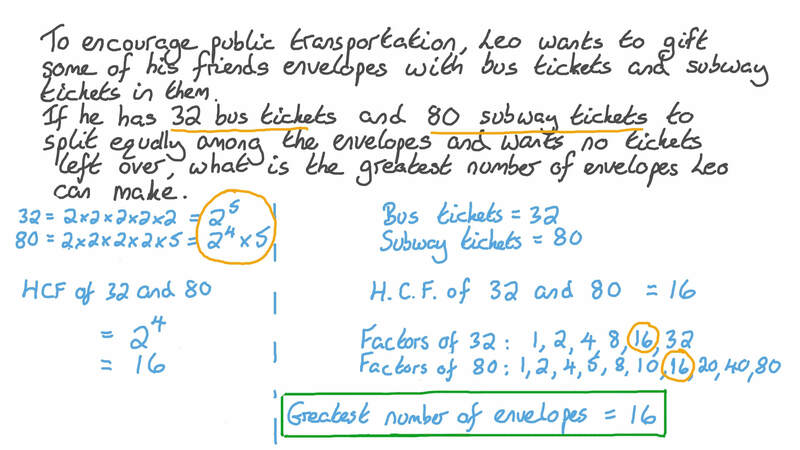 If he has 32 bus tickets and 80 underground tickets to split equally among the envelopes and wants no tickets left over, what is the greatest number of envelopes Leo can make? Farida baked 10 chocolate muffins and 15 blueberry muffins. She wants to divide them into boxes to give to her friends. Each box must contain only one type of muffin, and there must be the same number of muffins in each box. What is the largest number of muffins that she can put in each box? How many boxes will she need? A florist has 91 red roses and 78 pink roses. He wants to make identical bunches using all his flowers. What is the largest number of bunches he can make? How many of each type of flower are in each bunch? Find the greatest common divisor of − 2 8 0 5 and 1 2 8 7 . Find the greatest common divisor of 3 4 5 2 9 and 3 2 9 2 3 . Nader has 4 pieces of wood with lengths 440 cm, 3.85 m, 55 cm, and 1.65 m. He wants to cut all the lengths of wood into equal sized pieces without having any leftover. By finding the GCF, determine the greatest possible length of each piece. Mona wants to make beauty packages as Christmas presents for her close friends. She has 18 lavender oil bottles, 26 bath bombs, and 6 bars of natural soap. If each package contains the same quantity of each item, and she shares out all of the items, determine the greatest number of packages Mona can make, and then determine the number of items in each one. To perform the never ending handkerchief magic trick, a magician wants to cut a yellow silk fabric of length 18 inches, a green one of length 20 inches, and a red one of length 24 inches into handkerchiefs of equal lengths. If he uses the total length of all the fabrics, determine the length of the longest handkerchief he can cut from each fabric, and then find how many handkerchiefs he can make in that case. Yasmine baked 12 chocolate muffins and 28 blueberry muffins. She wants to divide them into boxes to give to her friends. Each box must contain only one type of muffin, and there must be the same number of muffins in each box. What is the largest number of muffins that she can put in each box? How many boxes will she need? A bookcase has three shelves. One shelf holds 10 books, one holds 16, and the other holds 22. Different numbers of identical section dividers are placed on each shelf, so that each section holds the same number of books. Determine the greatest number of books that can be put in one section.